If you’re homeless, where can you go for shelter? 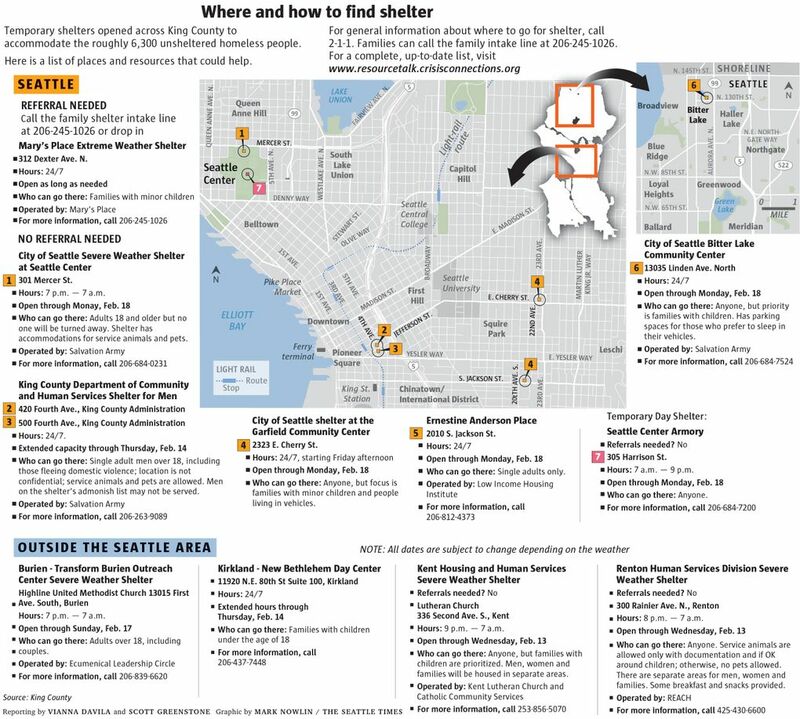 A list of emergency shelters opened in King County. Below are some of the ongoing shelter and resources available during this winter weather, if you are unsheltered, or if you know someone — or see someone — outside in the cold who needs help and isn’t sure where to go. 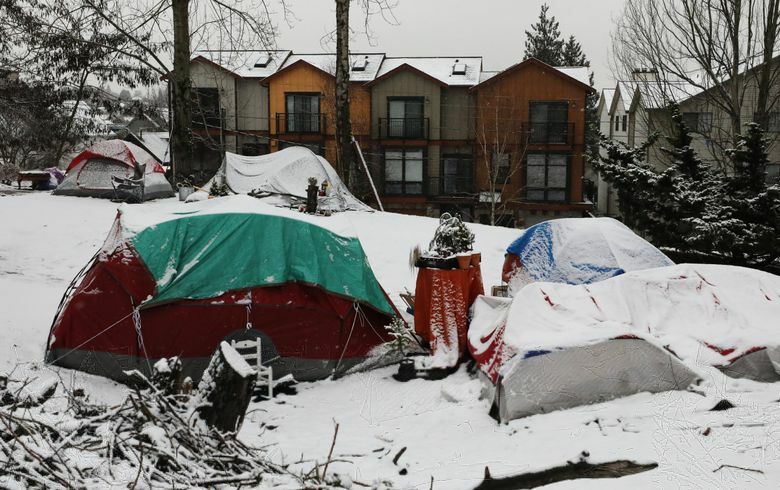 In all, the city and county have opened 500 additional shelter beds since the snow started, Mayor Jenny Durkan said Wednesday. New in this post are resources for older people, who may not be homeless but may be stuck in their homes. If you are an older adult, an adult with a disability or a caregiver, or if you know anyone in those categories, call Community Living Connections at 1-844-348-5464 or visit here. Or check out here for resource help. Always remember, you can call 211 for shelter help, 911 in emergencies or if the 211 line is closed, or King County’s 24-hour crisis line, 1-866-427-4747. And remember, there are other shelter resources in the county that operate year-round that may not be featured in the map or list below. More shelter information can be found here. For the most up-to-date information, check the text that continues below the graphic. The text is being more regularly updated. Call the family shelter intake line at 206-245-1026 or drop in. Hours: 7 p.m. — 7 a.m.
Who can go there: Adults 18 and older, but no one will be turned away; has accommodations for service animals and pets. Who can go there: Single adult men over 18, including those fleeing domestic violence; location is not confidential; service animals and pets are allowed. Men on the shelter’s admonish list may not be served. Who can go there: Anyone, but priority is for families with minor children and people living in vehicles. Who can go there: Anyone, but priority is families with children. Has parking spaces for those who prefer to sleep in their vehicles. Hours: 7 a.m. — 9 p.m.
Who can go there: Adults over 18, including couples. Will connect families to Mary’s Place shelter in Burien. Who can go there: Families with children under the age of 18. Adults must have legal custody of the child. Hours: 9 p.m. — 7 a.m.
Who can go there: Anyone, but families with children are prioritized. Men, women and families will be housed in separate areas. Hours: 8 p.m. — 7 a.m.
Who can go there: Service animals are allowed only with documentation and if OK around children; otherwise, no pets allowed. There are separate areas for men, women and families. Some breakfast and snacks provided. Seattle Times Project Homeless engagement editor Scott Greenstone and reporter Vernal Coleman contributed to this report.